Everybody knows of Abraham Lincoln. They know that one night he went to the theater to see the play “Our American Cousin”, and while he was there, he was assassinated by a gunshot to the head, by John Wilkes Booth. 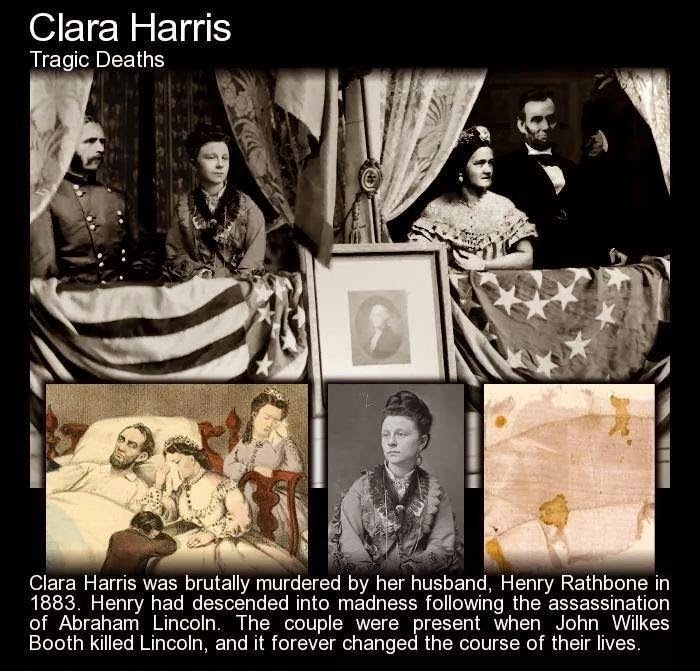 There were other people in the private box with him, Clara Harris was a long time friend of both Abraham Lincoln and his wife, Mary Todd Lincoln. Clara was the daughter of a prominent, wealthy New York family. She was engaged to Henry Reed Rathbone, and he also accompanied the Lincolns to the theater that fateful evening. Let us just focus on Clara and the impact the Presidents assassination had on her life. "Poor Mrs. Lincoln, all through that dreadful night would look at me with horror & scream, 'oh! my husband's blood, my dear husband's blood'...It was Henry's blood, not the president's, but explanations were pointless." Due to the magnitude of the events, Clara could not bring herself to get rid of the dress she was wearing that fateful night, nor have it laundered. She kept it in a wardrobe in her residence. In 1867, two years after the assassination of the President, Clara and Henry were married. During their married life, they had three children together. Henry though never recovered from the assassination. He blamed himself for the Presidents death, and nothing anyone said to him would make him think otherwise. He became paranoid and delusional. He started imagining terrible things, and his condition only worsened over time. He drank to ‘keep away the demons’, but of course the drinking only bought on a whole new level of demon. Clara feared for herself and for her children. If divorce or separation was not so severely frowned upon at that time, she would have fled back to her family in New York. "I understand his distress...in every hotel we're in, as soon as people get wind of our presence, we feel ourselves become objects of morbid scrutiny.... Whenever we were in the dining room, we began to feel like zoo animals. Henry...imagines that the whispering is more pointed and malicious than it can possibly be." Despite all of this Henry was eventually appointed US Consul to the Province of Hanover. This led to the family moving to Germany, where Henry continued to threaten Clara, and even went so far as to show envy at the attention she gave their children. In 1883, just before Christmas (23 December), Henry entered Clara’s bedroom, and after arguing with her about their children, pulled out a revolver and shot her. The shot alerted the servants, who came running to the room. When they arrived, they saw Henry with a knife in his hand, stabbing himself in an attempt at suicide. He managed to stab himself six times before the servants wrestled the knife out of his hand. He was babbling incoherently about voices coming from behind the pictures. Just as with the Lincoln assassination, the person shot died. But the person who had the run-in with the knife lived. This act was the final straw for Henry’s sanity. He was institutionalized in a German asylum for the criminally insane. He was never released, and suffered terribly in this asylum. He died in 1911 and was buried next to his wife Clara. In a sad turn of fate, the cemetery that they were buried in had a visitation policy. If your grave was not visited, you were deemed eligible for cremation, due to space requirements. In 1952 the Rathbone’s were disinterred, created and disposed of. Whatever happened to the dress Clara was wearing though? Well, as stated previously, Clara kept the dress stored in a closet in their family home in Albany. She claimed that the ghost of Abraham Lincoln visited her, and the visitation frightened her so much that she had the closet bricked up. She was woken up one year to the day of Lincoln’s death. She heard low laughter coming from the closet, and she swore it was Lincoln’s laughter. She chalked it up to her imagination, until exactly one year later a guest staying in the room heard the exact same thing. It was then she decided to make it inaccessible. This did not mean that it’s ‘effects’ were gone though. People in later years claimed to have heard gunshots, seen a blood soaked young woman standing with Lincoln, and all manner of spooky stories. The dress was said to have been nothing but a curse to the family, and knowing what happened to both Clara and Henry, that could very well be true. In 1910 their eldest son, Henry Riggs Rathbone, had the bricks removed and the dress destroyed in an attempt to rid the family of the dreaded curse. Main photo: Recreation of the seating in Lincolns booth – Henry Rathbone, Clara Harris, Mary Todd Lincoln and Abraham Lincoln. Inset left: Lincoln, his wife by his side and Clara Harris seated behind the chair. Inset right: A piece of the Harris dress lining.